While French sea captain Auguste Duhaut-Cilly may not have become wealthy from his around-the-world travels between 1826 and 1829, his trip has enriched historians interested in early nineteenth-century California. Because of a poor choice in goods to trade he found it necessary to spend nearly two years on the Alta and Baja California coasts before disposing of his cargo and returning to France. What was bad luck for Duhaut-Cilly was good luck for us, however, because he recorded his impressions of the region's natural history and human populations in a diary. This translation of Duhaut-Cilly's writing offers today's readers a rare eyewitness account of the pastoral society that was Mexican California, including the missions at the height of their power. A veteran of the Napoleonic wars, Duhaut-Cilly was an educated man conversant in Spanish and English. He was also Catholic, which gave him special access to the California missions. Thus his diary allows the reader an insider's view of the padres' lives, including their dealings with the military. Through his eyes we see the region's indigenous people and how they were treated, and we're privy to his commentary on the behavior of the Californios. 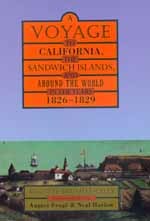 This translation also contains Duhaut-Cilly's account of the Sandwich Islands portion of his voyage and provides an authentic rendering of life at sea during the early nineteenth century. In the spirit of Richard Henry Dana's Two Years before the Mast, Duhaut-Cilly's reflections are a historical gem for anyone with a love of personal narratives and original accounts of the past. Auguste Duhaut-Cilly was a nineteenth-century trader and explorer. August Frugé is the former Director of the University of California Press and author of A Skeptic among Scholars (California, 1993). Neal Harlow is the author of (California, 1982).